Bir KULLANILAN arıyorsunuz SERIES 15 ? 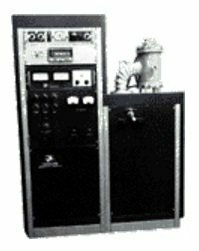 The Centorr Series 15 High Temperature Vacuum or Controlled Atmosphere, Top Loading, Cold Wall, Refractory Metal, Laboratory Furnaces are simple and easy to operate. A furnace system typically consists of the Basic Furnace Chamber Assembly, the High Vacuum System or Evacuation System, the Process Gas System, the Power Supply, the Temperature Control Instrumentation, and the Furnace Mounting System. These furnaces are built having Heat Zone sizes of 2" Dia. x 2" High to 5" Dia. x 16" High, and capable of operating 2500°C. It is possible to operate in High Vacuum, in Inert Gas, in Reducing or in Oxidizing Atmospheres. The Vacuum System is capable of attaining 10-6 Torr. The Furnace Chamber may be backfilled to 2 PSIG. The Furnace is completely assembled and thoroughly tested prior to shipping; a copy of test results will accompany shipment. Yeni satın almak isteyen CENTORR SERIES 15 ?